There’s never a time when I feel older than when I’m watching the Grammy Awards. Holy moly. Am I that out of touch that I don’t know about 50% of the nominees? And that I actually have to Google people to determine if they’re male or female or not even just one person but a group? I’ve always considered myself pretty astute when it comes to music, so this makes me incredibly sad. But I’m just going to blame it on the fact that a) yes, I am old now and b) technology makes it way too easy to stick with your fave music genres instead of just listening to “what’s popular.” And really, it’s probably better that way. I try to keep up to date on current millennial trends (technically, I am a millennial…), but it seems to get harder and harder. The only consolation I have is that Chris is generally even more out of touch than me (sorry, honey)… I recently had to teach him what #SquadGoals were and what “Cash me ousside” means. If any young person could overhear our conversations, they’d definitely be rolling their eyes and LOLing big time. BUT I think I make up for it by staying on top of food trends and basically having the shelves of my grocery store memorized. Yup, I am my 12-year-old self’s nightmare. So, if I’m feeling totally out of touch watching music awards or movie awards (let’s face it, I’ve never seen any of the movies and don’t know who most of the actors/actresses are), I can at least distract myself with snacks. Same goes for the Super Bowl, though I’m a little more invested this year (go Patriots! )… Then again, after years of watching football games, I still only have a loose idea of the rules and only really know what’s going on about 50% of the time. Probably because I’m running to the kitchen to refill the chip bowls, get the chicken out of the oven, or get a plate of these cookie bars ready. Priorities. 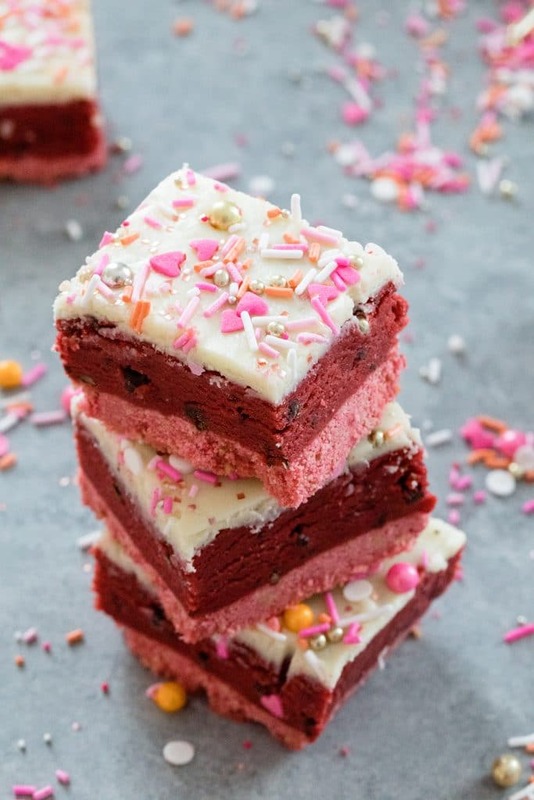 While I made these Red Velvet Cookie Dough Bars specifically for Valentine’s Day festivities, they’re also quite suitable for awards show season, Super Bowl watching, and more. They’re a good distraction when you have no idea what’s going on and are a good conversation starter when you can’t comment on that football penalty or pop star. I made the cookie crust with Golden Oreos, but added a little food coloring when I crumbled them up to get to a nice shade of pink. If you’re looking for a good food coloring, I’ve been using Wilton’s Color Right System (affiliate link!) for the last few years and can’t recommend it enough. It seriously makes it so easy to get your baked goods the perfect shade. 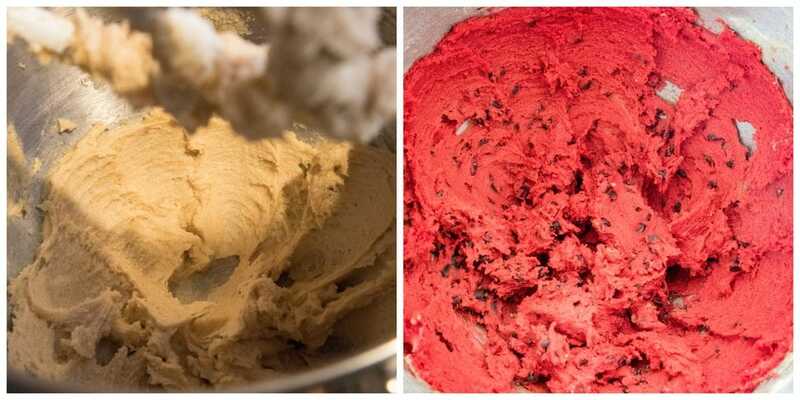 The red velvet cookie dough is basically a big batch of edible cookie dough with mini chocolate chips and red food coloring mixed in. It’s similar to the red velvet cookie dough I made for my Red Velvet Cookie Dough Ice Cream, but with a little more flour to stabilize it a bit more for the purpose of these bars. 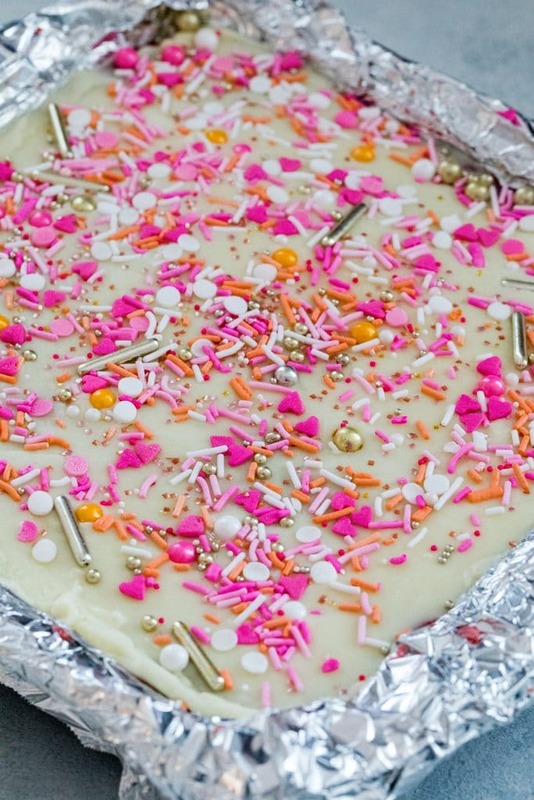 I made a white chocolate ganache to spread over the top of the bars and added a healthy amount of sprinkles on top. In case you’re wondering, I used my Sweetapolita Twinkle Sprinkle Medley for this. 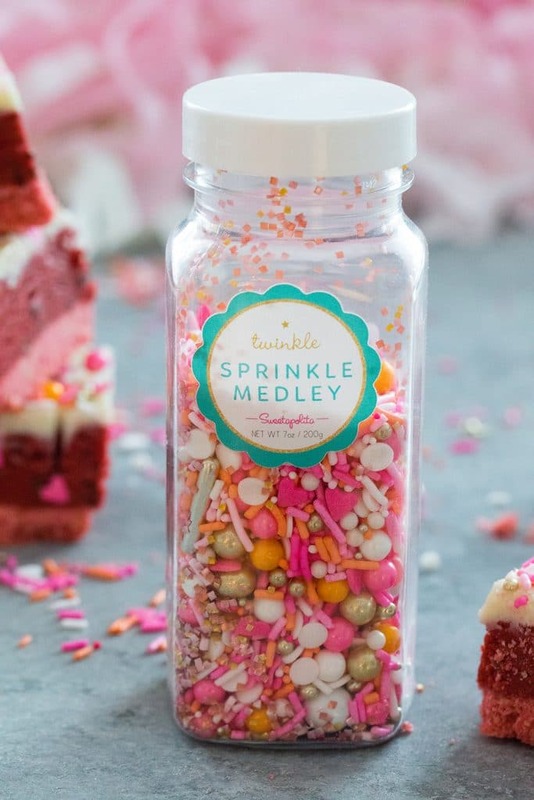 Her sprinkles are the BEST ever and I only use them when it really, really counts. Like on these red velvet cookie dough bars. Hello, lover. But seriously. 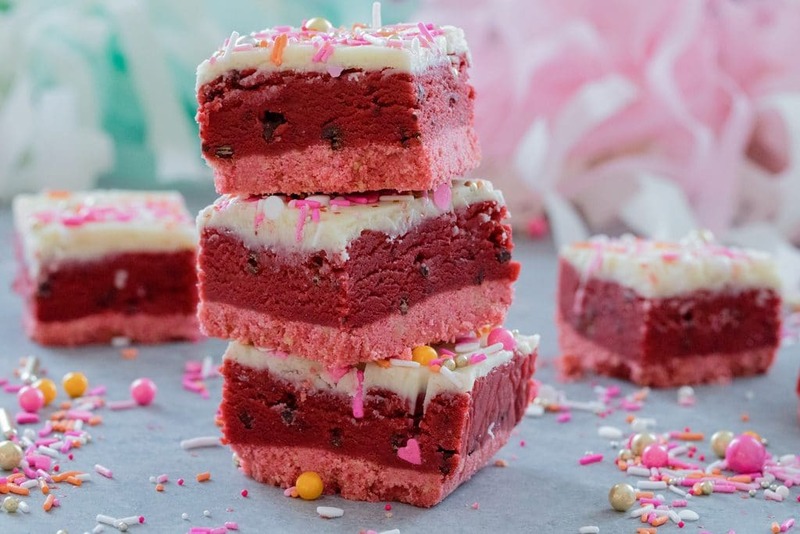 If you don’t have a valentine this February 14, these red velvet cookie dough bars would be very happy to be your valentine. And if you do have one, I’m sure they’d appreciate a batch of these on the day of love. Chris and I don’t do gifts or dinner out on Valentine’s Day anymore (way too many bad experiences with overly crowded restaurants and “special” menus that aren’t actually special at all), but we try to do something a little nicer at home with dinner and treats like these. Though, who am I kidding, you know Chris gets cookies and brownies pretty much on a weekly basis, so Valentine’s Day is no different! With these in hand, I don’t care who the heck is playing on the radio. I’m just over here nerdily rocking out to the Hamilton soundtrack (and the remixes!) and chowing down on red velvet cookie dough bars. Really not sure how we existed before edible cookie dough was a thing and that’s certainly not a time I’d ever want to go back to. And this is officially your call to start celebrating Valentine’s Day- it’s February in 3 days, after all (eeek! I still haven’t finished writing out my 2018 goal journal. Oops?). And the holiday is always a wonderful excuse to have a few extra baked goods in your house. 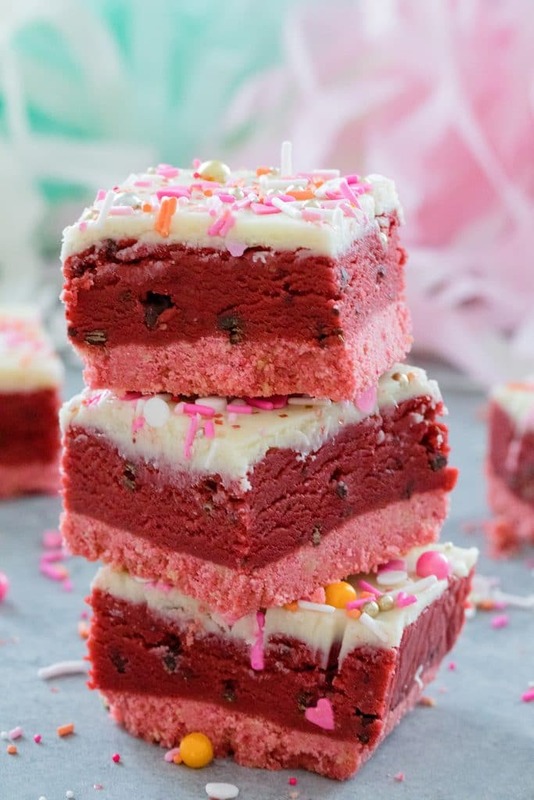 Even though I’ve made them several times already, I might just have to make these red velvet cookie dough bars one more time! 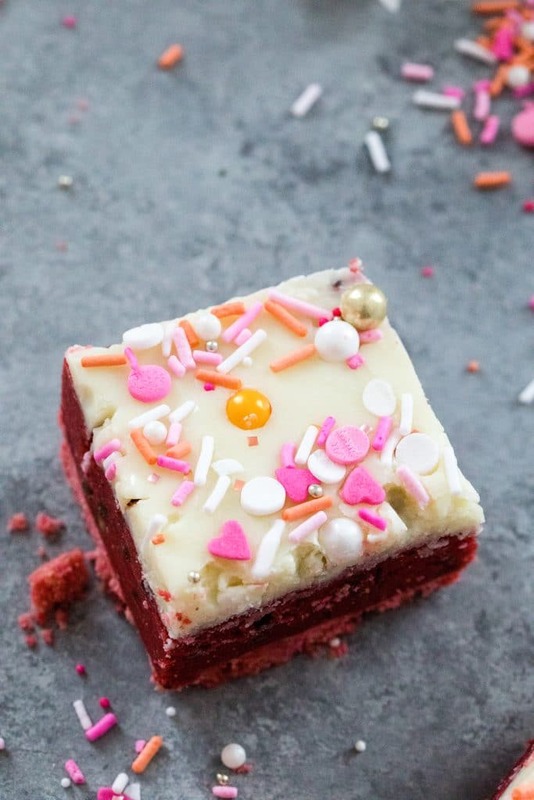 Perfect for showing your love this Valentine's Day, these Red Velvet Cookie Dough Bars are composed of a pink cookie crust, a luscious layer of chocolate chip red velvet cookie dough, and a white chocolate ganache topping. And don't forget the sprinkles! 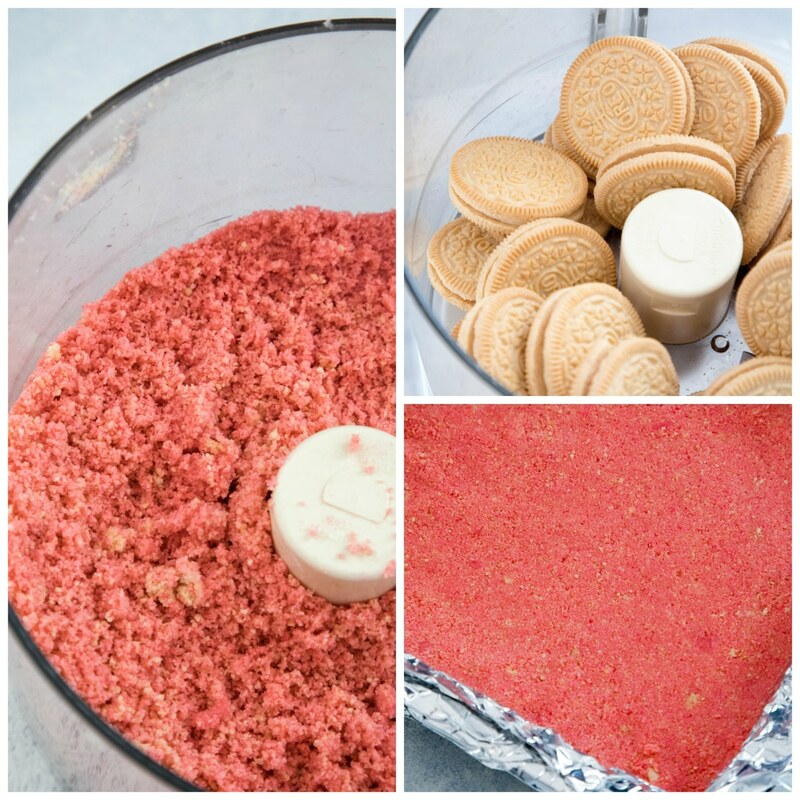 Put Oreo Cookies in a food processor and blend until they turn into fine crumbs. Pour in melted butter and food coloring and pulse a few times until well blended. Line an 8x8 baking pan with foil and lightly coat with cooking spray. Pour cookie crumbs into baking pan and press down into even layer on bottom of pan. Place pan in freezer for 30 minutes while you prepare the cookie dough. In the bowl of a mixer or in a large bowl with a hand mixer, cream butter and brown sugar on medium speed until light and fluffy, 3-4 minutes. Add vanilla and salt and blend until combined. With mixer on low, slowly add flour and cocoa powder to bowl until well combined. Mixture will likely look crumbly. Keep mixer on low and add milk in until dough comes together. Mix in red food coloring and mini chocolate chips until just combined. Remove pan with cookie crust from freezer and press cookie dough into an even layer over cookie crust. Pour white chocolate ganache over the top of the dough and smooth evenly with a spatula. Sprinkle sprinkles over ganache. Place pan in fridge chill for at least 45 minutes. Once chilled, remove bars from pan by lifting foil. Using a sharp knife, slice into squares. Place white chocolate in a heat-proof bowl. Heat the cream in the microwave util near boiling. Pour cream over chocolate and let sit for about 1 minute before whisking until the chocolate is completely melted and the ganache is smooth. If you are wary of eating raw flour, you can toast it. Just spread flour on a baking sheet and bake at 350 degrees for about 5 minutes. 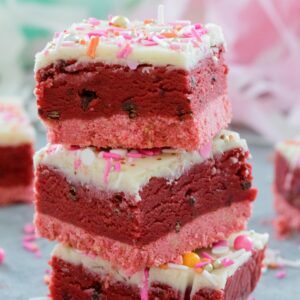 21 Responses to "Red Velvet Cookie Dough Bars"
I saw these on Pinterest and chad to come check them out. These are so pretty and so festive. I love them! These look so perfect for Valentine’s Day. So pretty! I love the layers and sprinkles on top! These are darling and look so good! I am a huge red velvet fan so these are definitely going to make their way into our February plans! Uhh these seriously look like heaven!! I love the sound of red velvet anything!! This sounds delicious and the recipe looks so easy. Love the colors! how perfect is this…love all the layers too. Is there really such a thing as too sweet? I think not! These look AMAZING. Also, don’t feel bad. I fell asleep before the Grammy’s were even half over. I’m soooo out of touch, too! Oh man, your comment about the Grammys is so relatable. I bartend in Southie and no one understands my cultural references because I’m almost 10 years older….when did that happen? Anyways, these bars are A++. I’ve had red velvet on the brain for weeks, but making a whole cake is a PIA. These look like the perfect solution. I had to giggle at your first couple of paragraphs. I’m not a millennial but I used to work at a music store (when those still existed! Lol) as a teenager and used to know every. single. artist. Now I’m like you, I don’t know 80% of the musicians! Ha! On a side note, these look too delicious to eat! @Lauren- SO true!! At my last job, I once said “show me the money!” and my co-workers looked at me like “huh? ?” They had never seen Jerry Maguire! Then I mentioned the Scream movies and again, no clue. I almost cried. Yeah, I can’t do the Grammys any more either. Too old for them! But, I do love classics like red velvet anything! These look delicious! I think my kids would go absolutely bonkers over these! Wow! This looks delicious and I’m sure my girls would go crazy for these! And I LOVE that they’re no bake. so wonderful and how beautiful layers these are! I’ve never seen a more Valentine’s Day-worthy treat!